Heat the milk in a pan, on medium heat. Cook the milk for about 5 to 10 minutes. Add in the coconut milk and green cardamom powder. Take off the milk mixture from heat. Heat the oil in a kadai, for deep frying. Drop small spoonful of idli batter in the hot oil. Fry them until they look very light brown in colour. Remove the fried paniyaram‘s from the oil. Drain the excess oil using the kitchen towel. Add the fried paniyaram’s in the hot milk. Let paniyaram’s soak for about 10 minutes. Paal paniyaram’s are ready to be served. Serve immediately, along with the milk. 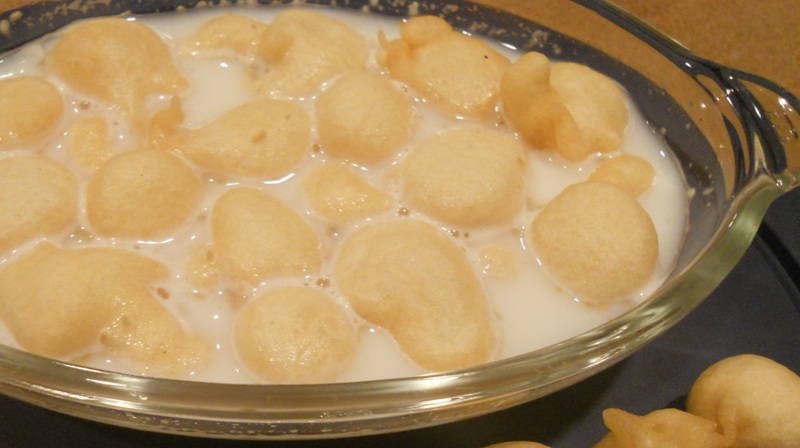 In case if you find that your dumplings/ paniyaram’s are too hard, you can immerse them in hot water for 5 minutes and then soak it in milk. You can vary amount of sugar according to your taste. If your batter is too thin, you can add some rice flour and mix well. Make sure you don’t add too much rice flour which will harden the paniyaram and it will be doughy. If you have any queries regarding the Paal Paniyaram recipe, please leave a comment.